Thank you so much Terry, it's always great to find others who enjoy trains as much as I. 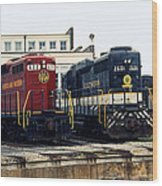 One of my favorite all time Diesel Locomotives are the GP series by General Motors these were the old workhorses of the 1950's through the 1970's era which I proudly called the Masters of The Freight. The red one is a GP-9 built in 1958 for Norfolk & Western Railway. 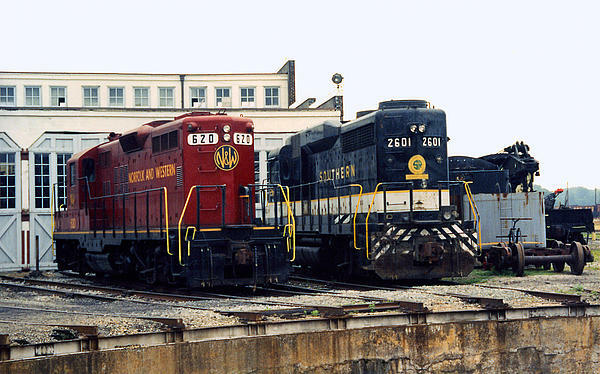 The black one is a GP-30 built in 1963 for Southern Railway. 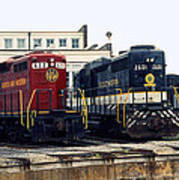 Both were built by the Electro-Motive Division of General Electric and were recently restored at the time of this photo. The roundhouse has a total of 37 bays and was built 1924 with a 100' turntable and has also been restored. 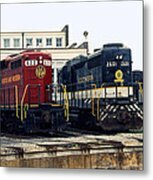 Photographed in Spencer North Carolina in the early 1990's, The Spencer Shops was Southern Railways largest steam locomotive facility in the southeast from the 1800's through the 1960's, it now houses the North Carolina Transportation Museum.